SEBRING SPRITE -- This fabulous high performance version of the Austin-Healey Sprite was first introduced in 1959 as a small, fast grand touring car with exceptional road holding and braking, to effectively cope with modern traffic conditions and high speed Motorway travel. Since that time, many owners have regularly used their Sebring Sprites in all forms of competition with outstanding results, and indeed, the name is derived from three successive class victories in the International Sebring G.T. and Sports Car races held annually in Florida. 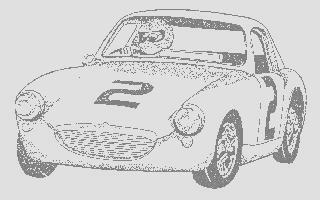 While the majority of Sebring Sprites are used in exhilarating personal transport, The Toy Shop/British Speedwell Racing is naturally aware that many are also in constant use for race and rally, and with this competetive requirement in mind, the cars have been fully recognized by the F.I.A. as standard production Grand Touring Cars. Sebring modifications can be carried out to customers own cars - or to our own vehicles for purchase. The comprehensive specification, with choice of six stages of engine tune ranging from 65 to 120 hp can be varied to suit the individual tastes and requirements of the owner and this includes such items as interior trim, color, instrumentation, stereo system, lighting, final drive ratios and safety belts. Clutch -- Single dry plate 6.25" diameter. Hydraulic operation, nine spring for road use, diaphragm style for competition. Final Drive and Gear Ratios -- Various alternatives are available to suit most requirements. Suspension -- Front independent, with wishbones, coil springs, anti-roll bar and radius arms rear quarter elliptic leaf springs; lever type hydraulic heavy duty shock absorbers or adjustable tube type. Steering -- Rack and pinion; wood or leather trimmed steering wheel; Lock to lock turning cycle approximately 31'6"
Brakes -- 8.5" Front girling disc brakes, rear 8" drums, rear disc brakes optional. Road Wheels -- Balanced 60 spoke Dunlop racing wheels, with center knock-on chrome hubs. 5.20 x 13" tires with tubes or 5" minilites. Fuel System -- AC type Y mechanical pump on Road and Sport models. S.U. electric pump on Competition and Race models. Tank capacity 6 gallons, competition 11 gallons. Lubrication -- Full pressure feed wet sump system, with full flow external oil filter and full flow oil cooler. Ignition System -- Coil and distributor. Spark plugs appropriate to degree of engine tune. Instruments -- Road cars: Speedometer with trip reading, fuel gauge, combined water temperature and oil pressure gauge, ignition, flasher, high beam indicators, and revolution counter. Ammeter, Halda Speedpilot, etc. optional. Race cars: as needed. Bodywork -- Two-door, two seater steel mono-construction. Optional aluminum bodywork. Front-hinged fiberglass bonnet. Detachable fiberglass hardtop, or fixed head coupe aluminum with curved laminate windscreen. Competition seats available. Weight -- The road version weighs approximately 13 cwt (without fuel); competition versions can be brought down to 11.25 cwt. Safety Equipment -- Roll bars, seatbelts, fire systems, etc. available as required by customer needs. SEBRING ROAD -- In-line 4 cylinder OHV water cooled, three bearing counterbalanced crankshaft. Bore 2.478"; Stroke 3"; Cubic capacity 948 cc. Fitted with high compression, solid-skirt pistons, sports camshaft and matching distributor, three-branch exhaust system and silencer, 7,000 rpm valve springs. Modified inlet ports and combustion chambers 9.0 to 1 compression ratio, approximately 55 hp. SEBRING SPORTS -- As Road version, but with enlarged inlet valves, polished and contoured combustion chambers, twin 1.5" SU carburetors on Healey speed manifolds with balance pipe and heat shield. 9.3 to 1 compression ratio, approximately 62 hp. SEBRING COMPETITION -- As Sports version, but bored out to 2.538" giving 995 cc. Fitted with special camshaft bearings, balanced and lightened flywheel, crankshaft, nine spring competition clutch, competition cylinder head gasket, SU electric pump. 10.0 to 1 compression ratio. Approximately 70 hp. SEBRING RACE -- Intended only for use on the track, in addition to the Competition specifications, this version has a special material racing crankshaft, the engine is balanced throughout, and the cylinder head is modified to full Formula Junior tune. Compression ration up to 11.0 to 1; from 80-95 hp and 1100 cc. 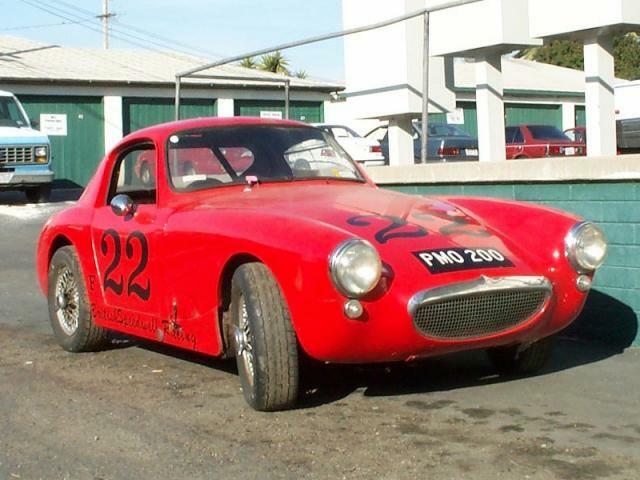 SEBRING MODIFIED -- 1275 to 1380 cc as required - not usable at all vintage events or vintage clubs. Built on request.